Stericycle Seal&Send Envelope - Unused prescription medications can fall into the wrong hands, potentially poisoning or killing a loved one. These free envelopes help you safely dispose of unneeded or expired prescriptions. 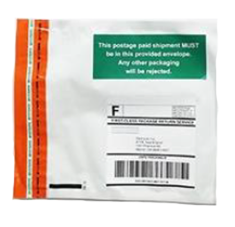 The DEA-compliant 8”x12” envelopes are designed to hold up to 8 oz. of medication, of which 4 oz. may be liquid in a sealed container. Simply seal bottles and vials into the envelope and drop it in the U.S. mail. Stericycle will destroy the medication using a process that is secure and safe for the environment. Envelopes are U.S. postage-paid, pre-addressed and include complete instructions. Orders through this site are restricted to a max of three envelopes per customer. Larger quantities are available. Please contact Stericycle for pricing at RxTakeBack@stericycle.com. discussion with their medical providers about the risks of prescribed opioids and whether there are safer, effective alternatives. 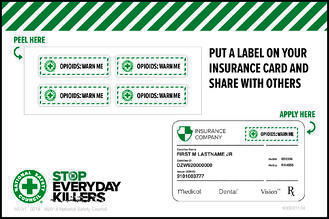 The self-stick labels fit on insurance and prescription cards without covering up important information. The card lists questions to ask of doctors, dentists and pharmacists. There are four labels per card to share with family and friends. Warn Me Label Sheet - Each sheet has 75 self-stick labels -- perfect for distribution at wellness fairs and safety events. 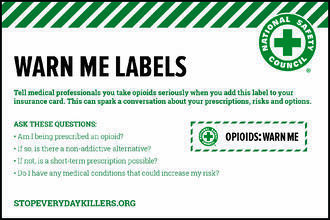 The National Safety Council encourages you to use these Warn Me Labels and prescription drug disposal envelopes to limit your risk from opioids. Find out more about the opioid crisis. If you need larger quantities of Warn Me Label Cards or Sheets for your workplace or an event, please contact bridgette.anderson@nsc.org. Are you ordering Warn Me labels for your workplace? Read the User Guide. Upon sign-up you will receive an email from nscnews@nsc.org confirming your order. If you do not receive an email within 48 hours, please email us at nscnews@nsc.org. Please also remember to add this email address to your safe sender list through your email provider to avoid updates going to your junk mail.